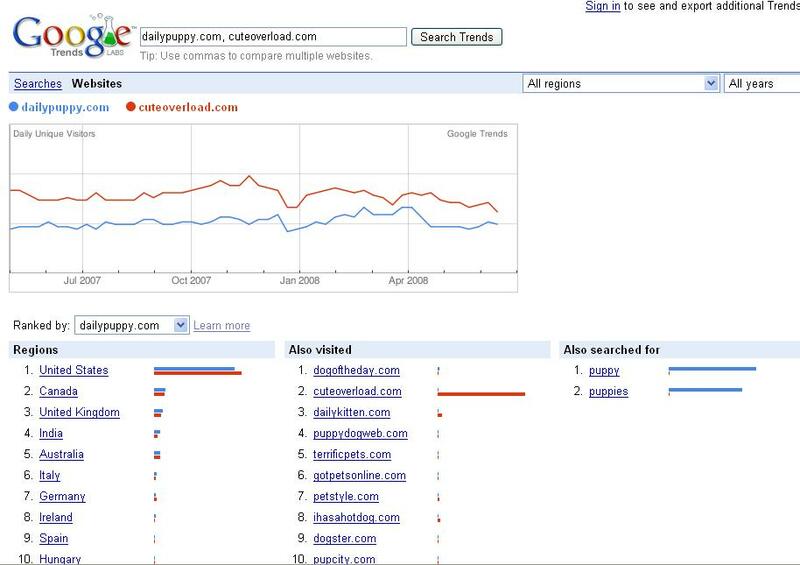 Google Trends for Websites? Not Cool, Google. Quite a bit of commotion today in response to Google’s decision to do something with all your site data they’ve been sitting on. Starting today, savvy site owners can use Google Trends for Websites to do some competitive research and discover unique site metrics like estimated traffic, also searched for, also visited, and traffic for different regions/countries. And it looks like there’s no way to opt out. Wow, way to go, Google! In order to power its new spy tool, Google is combining Google Analytics data, search volumes and other third-party market research. The traffic information will be neatly plotted out for you in a line graph, with the rest of the information listed underneath. Site owners will have the opportunity to get secret data on five domains at a time. It does come with some caveats though. For example, beware that the information may or may not be totally accurate. Since Google Trends is in Google Labs they claim to have no way to improve the quality of the data. They also add that since the data is estimated and aggregated over a variety of sources, it may lose some of its validity. Then by all means, still put it out there. You’re also dealing with a pretty limited data pool as the information typically only goes as far back as mid 2007. This is Google “Trends”, right? How well can you spot long term trends with only a year’s worth of data? And if you’re a small business, don’t even bother putting in your domain. You probably don’t receive enough traffic for Google to care about you or your competitors. Sorry. Have a cookie instead. Barry Schwartz calls the tool “a great way” to find additional keywords, link partners and resource, but I’m not so sure. Personally, it makes me a bit uncomfortable that Google has no problem handing out site owner’s information like this. What if you don’t want your keywords and traffic information published for everyone to see? Sure, there are plenty of other ways to get this information, but let those other independent companies do it. Google’s just shelling it out there for no reason and without getting consent first. Lame. I’m no Google conspiracy theorist, but it makes it hard to continually hand over information to Google when you know “features” like this are running around in the back of their heads. Who knows what’s coming next. Again, it’s not that the information Google’s handing out is super secret, but what in the world made them think site owners would want them to use their information in this way? It’s also interesting that you can’t get information about Google itself, but you can get information about Microsoft and Yahoo. Now, now, Google, play fair. I don’t know. Take the new feature as you will, I guess. Just try and use it for good. Nice tips. This is crossing the link. My assumption is they released this information to help motivate people to do more advertising if they can see exactly where the competition is or what geographical markets the competition seems to be attracting. Lisa, your statements are a little strong given the underlying facts. How is this different from Compete.com or any other? So, for YOUR data to be included (as statistical background information) you have to opt in to data sharing. Even then, your data isn’t shared with Trends users, it’s used to help them ‘true up’ the estimates. I see this as a similar offering to the services that Matt mentions above…nobody complains about them, so I fail to see the reason for the outrage. So long as you have a public website, it’s going to get sliced and diced for rankings and statistics…that’s just the way it is and people shouldn’t be shocked by that. Hey Lisa, I thought I’d add a few thoughts, because I got to meet this team up in Kirkland the day before SMX Advanced. When I met them, the Trends folks seemed really smart and sincere, and I think that they want to iterate to improve Trends over time. So I wouldn’t ding it or assume that the data is inaccurate just because it’s on Labs. Though it’s on Labs and only gives a year or so of data right now, I’d expect that over time the data would grow more helpful (just like the main Google Trends product has gotten better about showing data over longer time periods). I think if you’re going to have a useful product though, it needs to do some of the other things that Compete/Alexa/Comscore/Hitwise/Quantcast can do. I don’t believe that any of those services have opt-out provisions for websites. Note that if a site has traffic below a certain threshold though, then Google won’t show data for that site. Given that lots of metrics companies will sell data on what search queries are related to a site, I kind of like that Google provides a small amount of this data for free, because it levels the playing field somewhat. And you only see ten (or less) queries related to a site, so it’s not that much data. I’ll pass on the feedback about providing metrics for Google sites. My personal guess is that given the brouhaha about Google metrics earlier this year (e.g. 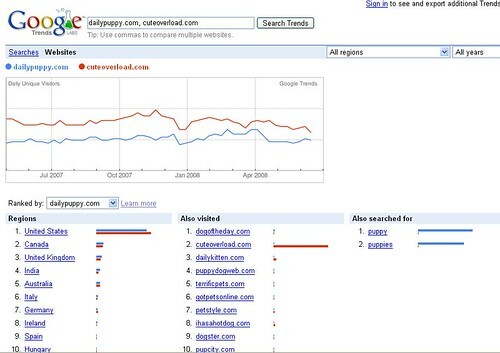 http://www.techcrunch.com/2008/04/21/why-comscores-google-paid-click-estimates-are-not-predictive-of-googles-revenues/ ), maybe the team wanted to start cautiously so that estimates on a Labs product wouldn’t be taken as gospel or as some sort of forward-looking guidance. Again, that’s just my personal guess, but I’ll pass the feedback on. Tell it like it is Lisa! This is crossing the link.